Keep cold at bay with warm Mediterranean fashion. 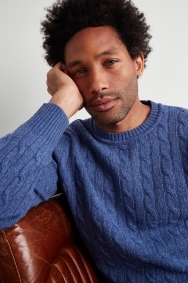 This Italian-made crew-neck sweater from Moss London will make a smart addition to your cold weather wardrobe. 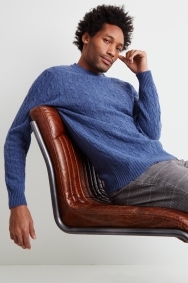 With its warm blue tone and classic cable-knit design, it’ll give your office or evening look a relaxed edge, while keeping off the chill. 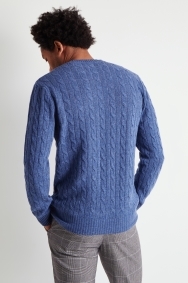 Made from lambswool-rich fabric, it can be machine washed for minimum fuss. This sweater’s crew-neck design will leave the collar of any formal shirt exposed. Team with a tweed-inspired jacket for an up-to-date take on a traditional look.